In July of 2008, the app store concept was launched by Apple and it has dramatically changed the mobile industry. Over 1.2 billion apps were downloaded between Christmas and New Year according to Flurry Analytics. That’s about 60 percent higher than every week of December before Christmas, and marks the largest number of apps ever downloaded in a single week. Robot app stores are now beginning to happen as well and visions of apps for tele-robotic safety and surveillance pop into mind, or light domestic duties, or…? My imagination runs wild at the thought and I imagine these new apps being easy to use, having multiple functions and a low cost. 1. MyRobots, by Canadian RobotShop, has opened a combination app store and online environment to permit robotics products to be monitored and updated seamlessly as well as providing a Cloud repository for applications that run from the Cloud instead of the robot itself. MyRobots’ slogan is “Connect your robots; reap the benefits.” The online monitoring aspect of MyRobots is similar to the MyMotoman Remote Monitoring Service initiated my Yaskawa Motoman America in August. 2. Robots App Store, by San Francisco serial entrepreneur Elad Inbar, is developing their store to be an online marketplace for selling apps and also providing developers their own sales portal. Robots App Store, in addition to attempting to trademark the hyphenated words “Robot-app”, has a wonderfully informative info-graphic explaining the need and market for robot apps. What it doesn’t explain is how the process will be different than what most of us have come to expect when buying apps from Apple’s App Store. It involves tinkering with development tools and operating system platforms – a turnoff for all but the most avid hobbyist. 3. RoboEarth, an EU public-private consortium, is using the Internet to create a giant open source network and database repository that can be accessed and updated by robots around the world. Focused more on academia and industrial applications, RoboEarth speeds up robot learning and adaption in complex tasks and can execute tasks that were not explicitly planned for when the robot was designed. Service robotics – as differentiated from industrial or defense/security/space robotics – needs to provide inexpensive and efficient assistance to humans to be profitable in the consumer marketplace and emerge as a serious industry. We already have vacuum robots and adaptive cruise control bots, but there are thousands of other possible applications. Entertainment, embedded systems, eldercare and home assistance are certain to be amongst the first groups to benefit as the service robotics industry materializes. At discussions with Elad Inbar, CEO of Robots App Store, I asked about the size of the marketplace and was surprised to find that there are 14 million service robots out there now, and it’s estimatited that by the end of 2014 there will be 24 million. If only 15% of them were able to buy two apps at an average price of $9.99, that’s $72 million in revenue. If they each bought five apps instead of two, the figure would be $180 million. If 20% purchased five apps it would be a $¼ billion business. How real and applicable those figures are depends on many complex variables: willingness of the buyer to tinker, quality of the apps, flexibility of the robots, price, disposable income, etc. In fact, apps for robots with an Apple or Android front end will not be available in the Robots App Store but will onlybe available through the Apple (or Android) App Store – which limits the market metrics… an example of this Apple exclusivity is the hundreds of thousands of Parrot’s AR.Drone quadcopters. Regardless of the metrics, the process of developing and sharing apps can provide a giant leap toward rejuvenating the robots we have and teaching the audience (the buyers) that they can get what they want from their robot(s). Thus the buyer becomes more educated and demanding and the producers less capricious — and more profitable. The goal for MyRobots is to get all robotic platforms to collaborate and operate together (regardless of their operating system) via the use of Cloud robotics. Although like other stores MyRobots will sell downloadable apps too, their main interest is to develop applications that will run on the Cloud thereby freeing computation time and resources on the robot and will make a single app compatible with many different robotic platforms. Cloud Robotics is the application of the cloud computing concept to robots. This means using the Internet to augment the robots capabilities by off-loading computation and providing services on demand. Being connected to the cloud also helps robots to collaborate with other machines, smart objects and humans. Through this collaboration, robots transcend their physical limitations and become more useful and capable since they can delegate parts of their tasks to more suitable parties. By combining increased communication capabilities to the ability and flexibility of running and storing part of their intelligence (i.e. software, behaviors and apps) on the MyRobots infrastructure, smart objects and robots become augmented and constitute a new and revolutionary concept for the future of robotic intelligence: Cloud Robotics. The central beauty of the App Store idea is that it enables a feedback cycle: The more devices (phones/robots) you sell, the more lucrative the app store becomes for 3rd party developers to program new apps. And the more new apps, the more devices you sell. In my opinion, robotics does not yet have critical mass to jump start this at the present time. RoboEarth is fast becoming a large shared repository for maps, object models, task descriptions, robot models, semantic relations, probabilistic relations and “action recipes” (apps) within the global academic community. It remains to be seen whether the big robot manufacturers will embrace the technology for their products. 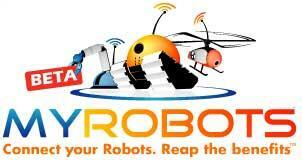 One unintended consequence of RoboEarth’s efforts may be within the used robots marketplace. Imagine the financial gain if an older, unused robot is rejiggered to have new equipment as well as easy to train software to put the robot back to work on new projects. Another possible beneficiary is the end user who will be less likely to retain an intergrator/consulting service if the robot can handle ongoing changes on its own. The ultimate goal of RoboEarth is to enable robots to share and store what they discover about the world on their own Internet. What do you want from a robot app store? Let’s compile a long list of “wants” and send them off to these app stores and see whether they can get them for us. Why should we wait to see if our app magically appears in their store? Let’s ask for what we want. Send them to me and I’ll combine them all and send them off to the stores.